When, in 2011, the BBC decided to move a huge part of their London operations to MediaCity in Manchester, it caused a huge stir. The corporation, which was under pressure to find savings, had always been based in London, but today the move has been hailed as a huge success, delivering massive cost savings for the corporation without any impact in its service output. For MediaCity, the project has evolved from a new development into a vibrant digital hub. The impact of the BBC’s relocation is clearer, and the region’s media sector is thriving. The BBC made the original decision to move to Manchester back in 2006 and accomplished the actual moving of jobs from 2011 to 2012. Back then, the BBC had its headquarters in London with regional offices throughout the UK, but they wanted to decentralise their operations further rather than carrying out most of the decision making in London. The north of England was seen an ideal location, not least because 25% of their license fee payers are based there, but with just 8% of programmes catered to this sector. Relocating to Manchester would allow the BBC to create more specialised content and boost their approval ratings in the North. Other objectives included bringing down costs and giving more support to the region’s independent production and media companies. The BBC eventually decided on Salford Quays, right in the heart of the newly established MediaCity. The centre was built by Peel Media to attract media talent and become a hotspot for content and innovation and is situated right beside the picturesque Manchester Ship Canal, the site totals 200 acres, with its offices balanced out by a five-acre piazza and plenty of cafes and shops. When the BBC made its move in 2011, though, MediaCity wasn’t as developed, which added to the risk. Eight years later and it has proved an ideal location, not just for the corporation, but also for a number of other local businesses. The BBC may be its most famous tenant, but it’s flanked by other big-name companies such as Kellogg’s and Ericsson, along with the University of Salford and hundreds of rising digital businesses. From 2011 to 2012, the BBC transferred its operations and staff over three phases. The divisions transferred to MediaCity were: BBC Sport, BBC Children’s, BBC Radio 5 Live, BBC Learning, Future Media and Technology (FM&T), the BBC Philharmonic Orchestra, Religion & Ethics, North West Tonight, BBC Breakfast and part of the Marketing, Communications & Audience team. As stated in a BBC audit report, the corporation managed to fulfil their timeline despite the challenges involved, already broadcasting from MediaCity in 2011 and completing the move by April 2012. They also stayed within the £223 million budget, which also covered redundancy package and equipment installations. From 2006 to 2011, employment in Britain was at a slump. The media sector was struggling, and the total number of jobs in MediaCity was going down. While there was a lot of hubbub around the BBC’s announcement to move, it didn’t have much of an impact on the regional economy, as pointed out by a Centre for Cities report. After the BBC’s move, noticeable changes appeared. Between 2011 and 2016, media jobs in general were still decreasing, but MediaCity defied this with strong growth of 72% all in all, or 27% if excluding the BBC relocations, and jobs rose by more than 2000. However, displacement played a huge role, with many of these being relocations from other businesses. Around three-quarters of these came from outside MediaCity in 2016, and most also came from within Greater Manchester rather than elsewhere in the UK. Ultimately, displacement played a huge role. Within the BBC itself, staff at Salford went up from 2,300 in 2012 to 2,500 in 2015, accounting for 13% of their national workforce. The overall result for Salford was hugely positive, with the BBC increasing creative jobs by more than 75% from 2011 to 2015. According to an independent report by KPMG, the BBC’s relocation contributed £277M to the UK economy (as measured by Gross Value Added) in just one year. The media sector has already reached a net worth of £3.1 billion in Greater Manchester as of 2017, which was twice as much as in 2010. Beyond the financial stats, creative talent is flocking to MediaCity as collaborations between independent digital agencies grow stronger. 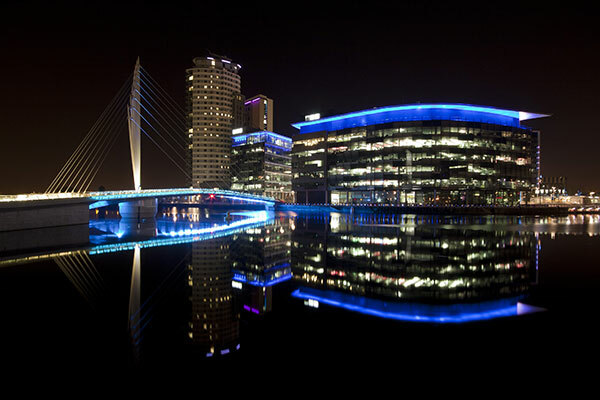 MediaCity is now an up-and-coming digital hotspot, and Salford was declared as one of the UK’s best cities for startups as of 2017, outranking London. While there’s much more to MediaCity than the BBC, the corporation’s move has sparked a trend and inspire many other companies to follow its lead. Greater Manchester’s officials further dubbed it a “British success story.” Even though the relocation process itself was hefty, the BBC’s move paid off—for itself, its audience, MediaCity, and the creative sector as a whole.